"Anonymous" Warns Ferguson PD Who Kill Unarmed Boy "This Is Your First And Last Warning"
“Anonymous” Warns Ferguson PD Who Kill Unarmed Boy “This Is Your First And Last Warning”. On August 9, 2014, an unarmed black teen was shot multiple times and killed by Ferguson, Missouri police. The public cried out, “Killed the police,” then looting, vandalism and riots soon followed. The community rose up in outrage. Videos and photos of the night of violence were uploaded on the Internet and YouTube. Protesters and eyewitnesses say the teenager who was killed, Michael Brown, was on his knees with his hands up when police opened fire. The ‘Hacktivist’ group “anonymous” has issued a direct warning to the Ferguson Police Department and anyone else dispatched to the protests stating that this is the “first and last warning” they will offer before taking action. 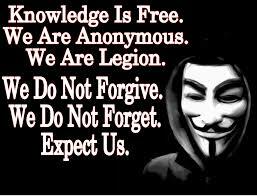 Greetings world, we are Anonymous. On August 9th in Ferguson, Missouri, the 17 year old and unarmed Mike Brown was shot several times and killed by an officer of the Ferguson Police Department. His body was left to die in a pool of blood in the sweltering heat for hours while 15 Police Department’s militarized the area against protesters, sealed the roads leading to Ferguson in a vain attempt to prevent protesters from reaching the city. The police have clearly crossed a line in the sand. For this reason Anonymous will not be satisfied this time, as we have in the past, with simply obtaining justice for this young man and his family. Anonymous demands that Congressional Representatives and Senators from Missouri introduce legislation entitled “Mike Brown’s Law” that will set strict national standards for police conduct and misbehavior in the USA. To the good people of Ferguson, take heart and take your streets. You are not alone, we will support you in every way possible. Occupy every square inch of your city. Demand justice, staying silent today could result in the death of your kid tomorrow. To the Ferguson Police Department and any other jurisdictions who are deployed to the protests: We are watching you very closely. If you abuse, harass or harm in any way the protesters in Ferguson we will take every web-based asset of your departments and governments off-line. That is not a threat, it is a promise. Attacking the protesters will results in the release of personal information on every single member of the Ferguson Police Department, as well as any other jurisdictions that participate in the abuse of this States own law. We will seize all your databases and email spools and dump them on the Internet. This is your first and last warning. The time has come for more than simple justice for these atrocities. The time has come to draw a line in the sand. The time has come to bring those to justice, who served to protect us, not kill us. Until justice prevails, hack and protest will replace it. Operation Ferguson engaged. The group has already shown that they have the capability of doing exactly as they state, as reports are coming out showing the city of Ferguson website was hacked on Sunday night. CLICK HERE —> TO LIKE DAILY BUZZ LIVE ON FACEBOOK!